I just released version 1.2.0 of Yokadi, my command-line todo-list. Several interesting changes landed in Nanonote recently, time to release version 1.1.0. There are a few fancy indentation improvements: pressing Tab when the cursor is at the beginning of a list item now indents the whole line, making it fast to create sub lists. Thanks to Daniel Laidig for this contribution. Conversely, pressing Enter on an empty list item now unindents the line, then remove the list bullet. URL detection has been improved to allow the +, % and ~ characters. This should greatly reduce the number of partially highlighted URLs. The application is now available in Spanish and French, thanks to Victorhck for the Spanish translation. 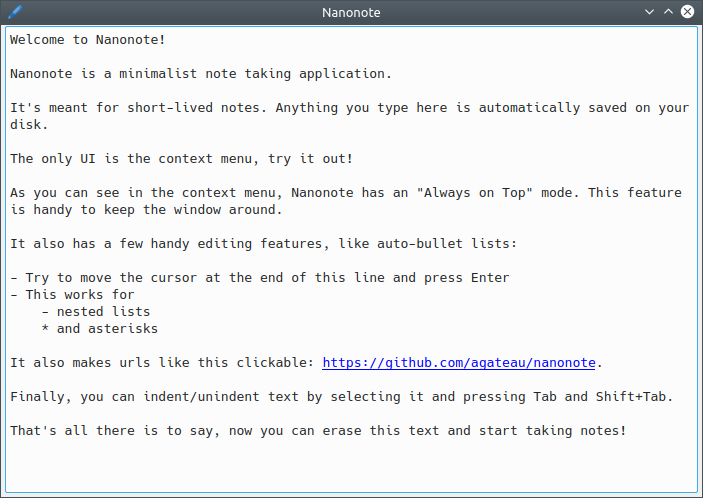 I recently configured Travis CI to build Nanonote, my minimalist note-taking application. We use Jenkins a lot at work, and despite the fact that I dislike the tool itself, it has proven invaluable in helping us catch errors early. So I strongly believe in the values of Continuous Integration. The first release of Nanonote, my minimalist note-taking app, was a bit rushed: I broke indentation shortly before tagging version 1.0.0... meh. So here is version 1.0.1. It fixes the indentation and adds the ability to indent or unindent whole lines with Tab and Shift+Tab, in addition to the existing Ctrl+I and Ctrl+U shortcuts. Here is the last issue of release month! Today is the first release of Nanonote, a minimalist note-taking application. It automatically saves anything you type in the screen on your disk. Being minimalist means it has no synchronisation, does not support multiple documents, images or any advanced formatting (the only formatting is highlighting urls). If you have long-lived notes you should store them in a more permanent place. Release month, Burger Party 1.3.0! Another weekend, another release! This one is special. You may remember a few years ago I created a burger game for Android: Burger Party. At that time I had plans to generate some revenue through this game. After investigating the different revenue models, I sadly concluded I would have to include ads. That did not work out (surprise! ): at its peak Burger Party reached a few thousand installations, which generated a meager $30 of revenue. I guess the reasons for this failure was that: 1. There were not enough ads to make it work: I decided against permanent banners so the game only displayed interstitials between levels, and no more than one ad every two minutes, 2. It did not reach enough installations, marketing is not my forte. Here is another release for the release month! This time it's a new release of Pixel Wheels. This one has been a long time coming: version 0.10.0 got released in September. Continuing on this release month idea started last week, here is a release of another project. Today is the first release of qpropgen, a tool to generate QML-friendly QObject-based C++ classes from class definition files. December just started, and this year I want to try to do something a bit similar to advent calendars: make a new release of one of my (too) many projects every weekend! This release month begins with the release of Doxyqml 0.5.0, an input filter to let you document your QML code using Doxygen. If you have been wondering about the lack of progress on Pixel Wheels, it's partly because last month I participated again to Inktober, the yearly event where you have to produce one drawing a day every day during October. The Inktober site provides word lists for each day, you don't have to use them, but I find having a word everyday helps getting started. Like last year, I also picked a recurring theme. This year it was robots.